Sepher HaShorashim im Nigzarim [dictionary of Hebrew roots and derivatives]. First Latin edition. Prepared by Sebastian Münster. Printer’s mark on title. Much use of Hebrew. Printed from right to left. ff. (496). Lightly browned. Later calf. Thick 12mo. Vinograd, Basle 58. Basle: Hieronymus Froben & Nicolaus Episcopius, 1539. 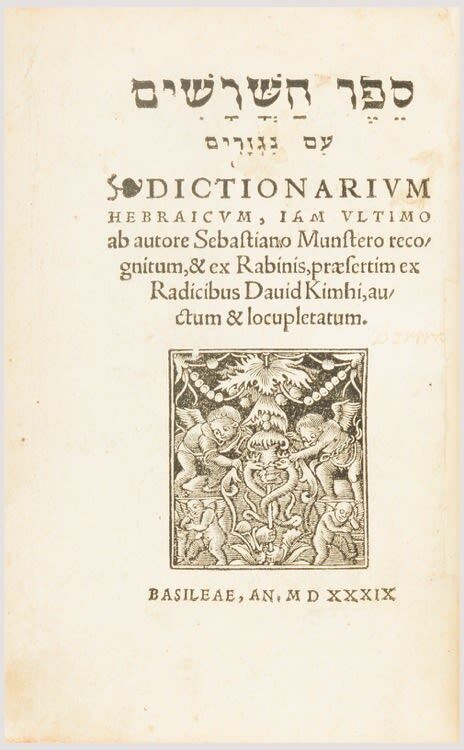 Münster translated Kimchi’s Sepher HaShorashim from Hebrew into Latin, all the while embellishing upon the original.